Xfce 4.10, desktop wallpaper is done using blender for the guy in the poster. Mine is pretty much the same as usual. Using openSUSE 12.1 KDE 4.7 (Waiting to see if a 4.9 repo becomes available). Only oddity is side panel, yawp plasmoid, and faenza based theme from a kde repo. 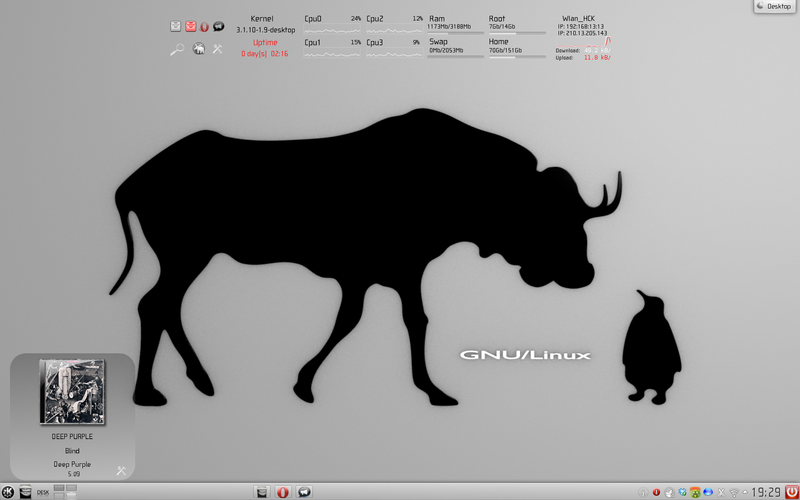 openSUSE 12.1 and GNOME 3.4.1 with a minimalistic Conky bar. Probably going to stay like this for quite some time. My first screen shot, hope I did this correctly. If you can see it, I did! Great job with those Blenders! Just breezing over the picture and not looking carefully, I would have thought it was a photograph or something. Seeing one in Xfce and one in KDE makes me wonder if there is a Gnome version lurking around there somewhere! malcolmlewis posted a screeny of gnome in some of the earlier screenshots thread.